Mikaela knew "Those humans did something to him!" 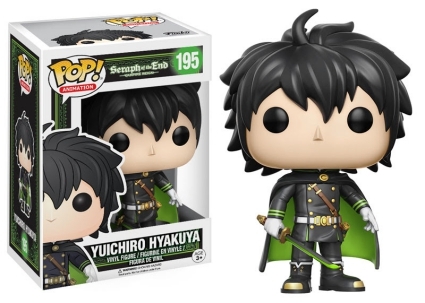 He wasn’t wrong because Funko Pop Seraph of the End brings the young group of survivors to the Pop! Animation line. Based on the Japanese fantasy manga series, Seraph of the End follows a group of orphans after a virus kills every human over the age of thirteen. Discovering the planet has been overrun by the once-hidden vampires, Yūichirō Hyakuya and his best friend Mikaela attempt to escape the vampire prison. Shop for Seraph of the End DVD/Blu-Ray options on Amazon. Leading off the lineup, Yuichiro Hyakuya features the standard Japanese Imperial Demon Army (JIDA) uniform accented with light green trim around the jacket cuffs and brass buttons. Without the JIDA cap, a slightly messy hairdo is revealed. The private, wearing a cape, also wields a matching demon katana with his white-gloved hand. 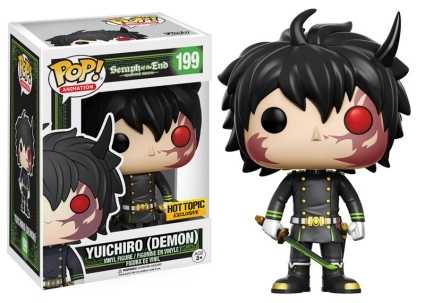 Yuichiro in Demon form, issued through Hot Topic, shows the devil horns poking through his black hair with scarring just below his bright red eye. 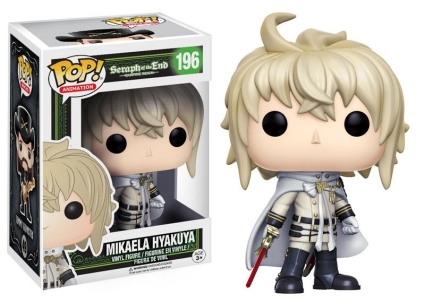 Although the vampire transformation is not yet complete, Mikaela Hyakuya holds a red sword and wears the traditional vampire cloak, in white, as well as all-black boots. 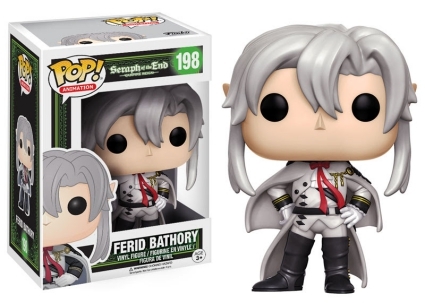 Meanwhile, the silver-haired Ferid Bathory sports a longer coat under the same vampire cloak along with a vivid scarlet ribbon tied in a bow around his neck. 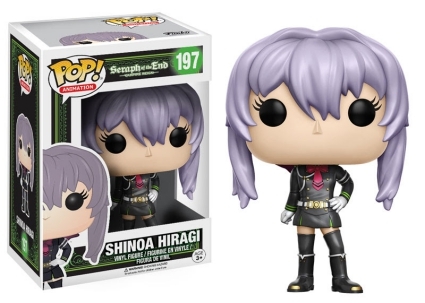 In addition, there are two options for the Shinoa Hiragi, the Demon Army sergeant. Standing with her hand on hip, Shinoa dons the JIDA uniform, which is comprised of a black coat and gold buttons, a wide magenta bow tie, and a skirt joined by thigh-high socks and knee-high boots. 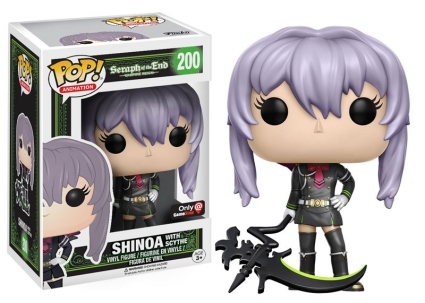 While both figures have purple-grayish hair, the GameStop exclusive variant holds a scythe at her feet. 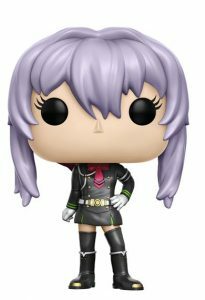 Funko Pop Animation: Seraph of the End - Shinoa Hiragi (#197) FREE SHIPPING! 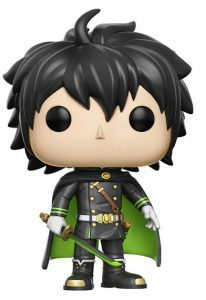 Funko Pop Seraph Of The End Vampire Reign Yuichiro Demon W Pop Protection Box!